Within our Wall Mounted Electric Fires category we list a range of Electric fires that are fitted by wall mounting (hanging) on the wall. Wall Mounted Electric Fires There are 43 products. Gazco Radiance 150W Black Glass Electric Wall Mounted Fire with vari-colour flame effect and mood lighting. 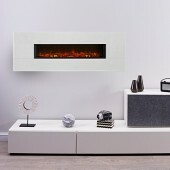 Gazco Radiance 100W White Glass Electric Wall Mounted Fire with vari-colour flame effect and mood lighting. Gazco Radiance 100W Black Glass Electric Wall Mounted Fire with vari-colour flame effect and mood lighting. Gazco Radiance 80W White Glass Electric Wall Mounted Fire with vari-colour flame effect and mood lighting. Gazco Radiance 150W Steel Electric Wall Mounted Fire with vari-colour flame effect and mood lighting. Gazco Radiance 80W Black Glass Electric Wall Mounted Fire with vari-colour flame effect and mood lighting.